This up-tempo ball control drill, introduced by Frank Lavrisha of Regis University, forces players to be attentive and aggressive. On defense, players need to constantly be focused on digging the ball high and in control. On offense, players need to be ready to react to any set and then attack. This drill is set up queen's-court style with 2 players per side. The team that wins the rally goes to the “queens” side and the losing team is replaced with 2 new athletes. 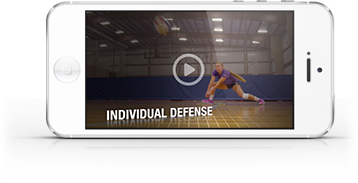 Each team is only allotted 2 contacts per side, and the second contact must be an attack in order for it to count. The first contact must be high enough to get teammates in a good position to swing. The idea is that if a player can hit the dug ball, a setter would definitely have enough time to get under it to set it. Once the ball is dug, it’s up to the other player to attack it. This drill forces hitters to be purposeful in getting their bodies to the ball and in a good position to swing no matter what.